Guitar Neck Shaving: How To Communicate The Shape Desired - Haywire Custom Guitars-Highly Recommended! I saw your website about your services including shaving down a guitar neck. How would I communicate the shape I wanted ? Would I ship the whole guitar to your shop ? How long would it take, approximately ? Is the base price $135 plus return shipping ? 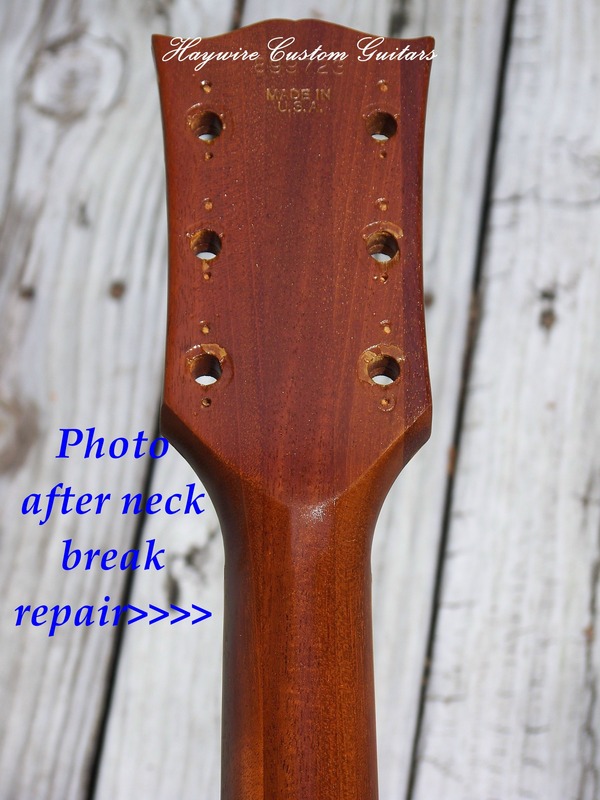 Thank you for stopping by the website and taking time to inquire about Guitar Neck Shaving . The best way to communicate what you need is to either work with specs from your existing neck or send a neck along with the one you’d like shaved. Ideally the sample neck you send should be what you’d liked duplicated on the neck to be shaved. We can duplicate anything. If you want to work from your existing neck then move the strings and take thickness measurements with a digital caliper. We do this every time a neck comes in to the shop. Take the sample thicknesses from-1st fret 3rd 5th 7th 9th 12fth frets. 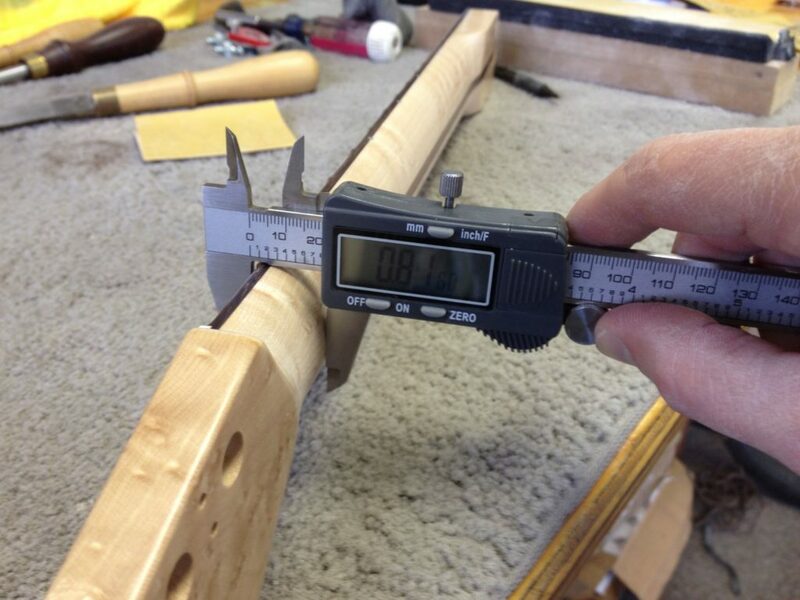 From those measurements we’ll be able to determine how much you need removed to make it a better playing neck for you. Similarly, we use those thickness numbers to work from. In the same way, we can get the reduction as close as possible within a few thousandths of what you need removed. There are other ways to communicate your desired result, such as simply: “I’d like a 20% reduction” and we can do that. The more specific you can be the better the outcome. We can duplicate anything you send us as well. The other consideration is the back profile and if you’d like it to stay the same or if you want a change. Guitar neck shaving, thinning or reshaping a guitar neck, re-profiling a guitar neck or shaping and duplicating guitar necks? We do it all as a result, you feel more comfortable with your guitar. Therefore, when you have a neck that you just love but it’s a bit too thick, we’ll shave it for you. 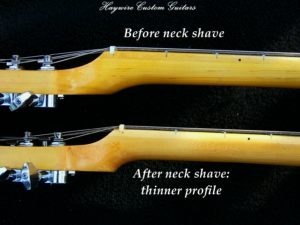 “Just $135.00 plus return shipping back to you will get guitar neck shaving done to a thickness more comfortable for you. no waiting. We work on the neck as soon as it gets here. the turn around time is 2 days or less from when we receive it”. Firstly, Ship with the US Post Office. They are less expensive and much more careful with your packages from our experience. Second, Forget buying “signature required” services. Our postal carriers know where to leave the neck safely and securely. These two tips will save you money, save time by getting us the neck sooner and delivered safely.